July 10, 2018 (San Diego) – Sempra Energy (NYSE: SRE) today announced that it is commencing concurrent offerings (the equity offerings) of $1.1 billion of shares of its common stock in connection with the forward sale agreements described below (from Sempra’s press release) and $500 million of shares of its Mandatory Convertible Preferred Stock, Series B, each in a separate registered public offering, subject to market and other conditions. February 2, 2016 (Sacramento) – Special interests spent a bundle on lobbying efforts in California last year—and in many cases, they got their money’s worth. October 9, 2015 (San Diego) - San Diego rallied to “SDG&E, Don’t Block the Sun!” on Wednesday, as hundreds gathered to protest San Diego Gas and Electric’s (SDG&E) proposal to the California Public Utilities Commission (CPUC) that would cripple rooftop solar power and eliminate customer choice, according to opponents. A crowd of more than two hundred people, including ratepayers, business leaders, a Grammy-winning artist, and the Hip Hop Caucus’ nationwide bus tour, rallied outside Sempra Energy’s headquarters to defend customers’ ability to go solar. "Reprinted with permission, originally published September 30, 2014 at Reporting San Diego." They also write that these activities implicate the Office of the Federal Attorney, Laura Duffey in San Diego. June 23, 2014 (San Diego)– More San Diego Gas & Electric (SDG&E) customers are now eligible to save every month on their bill and receive energy efficient home improvements due to new income guidelines that went into effect June 1, 2014. Households of two with a yearly income of $31,460 or less can now enroll in the money-saving, state sponsored customer assistance programs California Alternate Rates for Energy (CARE) and the Energy Savings Assistance Program. April 5, 2014 (San Diego’s East County) -- U.S. District Court Judge M. James Lorenz has issued a ruling in a case challenging the U.S. Department of Energy’s approval of a Presidential Permit issued for Sempra Energy's cross-border transmission line. The line would connect Sempra’s Energia Sierra Juarez Wind project in northern Baja, Mexico with SDG&E’s $435 million ECO substation now under construction. March 2, 2013 – Sempra Energy, parent company of SDG&E, this week reported 2012 earnings of $859 million, or $3.48 per diluted share, compared with $1.3 billion, or $5.51 per diluted share, in 2011. 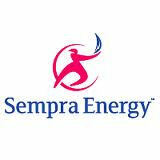 Earnings for Sempra Renewables division took a huge leap in 2012, increasing to $61 million from $7 million in 2011. Fourth-quarter earnings for Sempra Renewables were $14 million in 2012, compared with a loss of $2 million in 2011, due primarily to the addition of solar and wind assets in 2012. Earnings for SDG&E increased to $484 million in 2012 from $431 million in 2011. For details, see the company’s announcement. December 4, 2012 (San Diego’s East County) – The board of directors of Sempra Energy (NYSE: SRE) announced last month that CEO Debra L. Reed has been elected chairman of the company. Effective Dec. 1, Reed will succeed Donald E. Felsinger, 65, who retired at the end of November after a 40-year career with the company. Reed was named Sempra Energy’s CEO in June of last year. July 5, 2010 (San Diego) -– The board of directors of Sempra Energy (NYSE: SRE) announced that Debra L. Reed has been elected chief executive officer of the company and a new member of the company’s board. Reed, 55, succeeds Donald E. Felsinger, who will continue in the role of Sempra Energy’s executive chairman until his planned retirement at age 65 in late 2012. Neal E. Schmale, president and chief operating officer of Sempra Energy, will remain in his current role until his planned retirement later this year. Dec. 16, 2010 (San Diego) – For the second consecutive year, Sempra Energy Foundation today announced $1 million in charitable donations to non-profit organizations in California and the U.S. Gulf region to help people in need. The contributions also include a grant-incentive program to support the Sempra Energy family of companies’ employee volunteer efforts.